No one really knows 'bout me. I'm Rob's secret, I'm his informant, I'm his shadow in dark places. No one ever takes me for more than a knockabout lad, a whip of a boy. They never really see. And I don't mind that they don't see. "It doesn't matter. My life can purchase twenty-seven others, Much. What would you have me do?" Much stepped up a stair, closer to me. "Fight." Loving him felt like drowning in his ocean eyes, like a tide I couldn't hold back, crashing on me again, filling me up with hurt and shame and despair. Standing so close to him, all I could think about were the hunger things I should have told him long ago. A hundred moments I'd lose because I were scared and weak and shameful. I cannot believe this released in 2012 and despite hearing of it's awesomeness I didn't read it until the tail end of 2014. Don't be like me! Read it now if you haven't! The Lion Heart is out in May and it's the perfect opportunity to binge read this amazing, incredible, and damn astounding series. Seriously, you can't lose. I love the Robin Hood mythology. I love the despite nobody knowing if this man ever really existed, people are drawn to the story of Robin, his men, the Sheriff of Rottingham Nottingham, and many other factors and make each retelling belong solely to its individual creator. 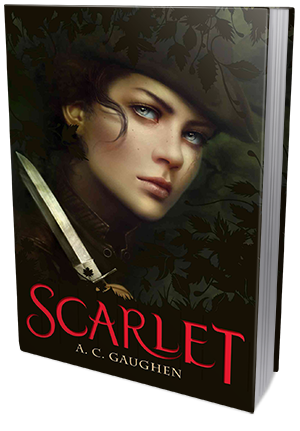 Scarlet is no exception to this and A.C. truly makes this retelling her own. Scarlet is running from a past she wants no one to know of and now that past has come back with a vengeance. What I love about this plot is that we don't know who Scarlet was or why she ran from her home. A.C. doesn't tell us until we and her band absolutely need to know. Scarlet hints at it certain points during her narrative, but we don't know the whole story. And when the whole story does come out - whoa. Scarlet is a strong heroine and stands up for herself. At the same time, she can be insecure and tends to hide when she's emotionally wounded or is scared. However, she doesn't allow this insecurity to put her friends in danger. It's almost as if, even though they can't see Scarlet, she's always watching from the trees. I loved the men in the band as well. Robin is definitely a looker and I was shipping him and Scarlet immediately. He is fighting for his people while at the same time fighting his feelings for Scarlet. It's obvious he likes her but doesn't want to let his feeling become a distraction, especially when it comes to the inner workings of their band. John and Much are great secondary characters and they treat Scarlet with respect and love. Together, the four of them are their own little family in the woods - so much more than just a band of individuals fighting for the less fortunate. The language was a bit hard to get used at first, but within the first chapter or two I didn't even notice. It was accurate and truly made you feel like you were in the story. In my opinion, it's one of those minor things you wouldn't think about otherwise, but without it something would be missing. It made the story real and held your attention. Scarlet's plot is intricately woven and won't let you sleep until you finish and even then - hello hangover! I flew though this book because I could not stand not knowing what was going to happen next. I had to know, I needed to know how is was all going to pan out. And once I finished . . . Oh, the feels.